I woke up early, because my taxi is picking me up at 6:30am. I decided to cross the border to Thailand on my own, instead of taking the bus with the rest of the other tourists. The bus is actually so much cheaper than doing it on my own, but I guess I wanted to the DIY route. Also, Tales of Asia (TOA) don’t really look highly on these buses. I arranged the taxi, again with Soryar. He quoted me a price that was the same going rate on the TOA website, so I figured it was good enough. Soryar said I can ask other travelers to share the cost, but since I’m not really friendly, I ended up shouldering the whole US$30 on my own. It’s expensive, but at least I didn’t have to make small talk and I have the whole back seat to myself. We left Mandalay Inn just a little past 6:30am, and the drive to Poipet just took a little over two hours. I was still mulling over what I’m going to do to get rid of my Riels and US$1 and $10 dollar bills, since I know I’d have a hard time exchanging those currencies when I cross over to the Thailand side of the border. I spot a foreign exchange sign just a couple of steps away from the immigration counters. I knew the rates they’d give me would be terrible, but it’d be even worse if I don’t exchange my money. I changed all my riels and small dollar bills to baht, so I’d have money to pay for my onward travel. Stamping out of Cambodia was easy enough. As adviced in Tales of Asia, I followed the people walking towards the Thai border. As we were approaching the friendship bridge, I notice the people crossing over to the left side of the road. I followed them and as soon as I’m on the other side, I realize why. Thailand, unlike Cambodia, drives on the left side of the road. The pedestrian traffic follows the same, so the immigration office is also on the left side. There was some people sitting and waiting just at the foot of the bridge with documents in hand. I thought I’d have to line up there as well (there were no other tourists crossing the border at the same time, so I was blindly following the locals), but I was pointed over to the health check. The A(H1N1) pandemic really has everybody on alert. I passed the screening (though no thermal scanner at this border), and headed into the Immiration office. Inside the office, you need to get the immigration form, fill it out and line up for the counter. There’s a small table with people crowding around, and once again, I thought I’m supposed to check there first. It seems that step was only for the Cambodian nationals, so if you’re not holding a Cambodian passport, you can go straight to the counters marked “Foreign Passport.” Once I was stamped into Thailand, I made my way out of the building and followed the line of people who are going out of border control. Right before the exit, there’s a toilet that requires a 3baht payment. Unfortunately, I didn’t notice the payment booth until after I finished. The toilet was clean, though most of the stalls have squat toilets. After paying the toilet fee, I made my way back out and wondered where to go next. Do I look pretty? No, you look blurred. The guide over at Tales of Asia says you need to hire a tuktuk to take you to the bus station. As always, the general advice is to agree on a price before getting in. I spot a female tuk-tuk driver and I asked if she can take me to the bus station. She held up eight fingers — eigthy baht. That’s the amount stated in the TOA guide, so there was no need to haggle for the price. I got on inside and we drove off. Some ways from the market, she suddenly turned off the main road and we came upon this clearning with some police. She turned to me and indicated that I must talk to the police. WTF? Turns out they’re just checking for whatever goods I’m bringing into Thailand. After a quick glance at the contents of my plastic bag containing my snacks and bottled water, they let us pass. The drive was pretty smooth, and it was a fair distance away, so the 80 baht is justified. She dropped me off at the market, and it was only after I circled the market that I found the ticket booth was right across where she dropped me. 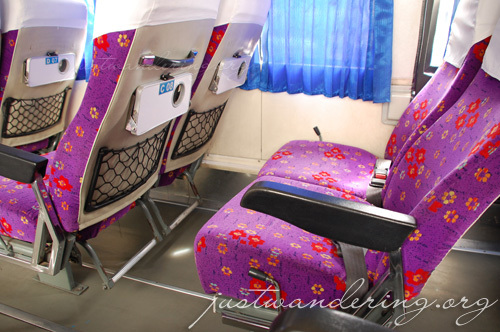 I took the first class government bus from Aranyaphratet to the Morchit station in Bangkok. It was double deck and airconditioned, and for THB 207, I get a free drink and a snack. I arrived at the station just a little before 10am. The bus is scheduled to leave at 10:30. There was a small waiting area and a solitary stall selling different kinds of snacks. I picked out two pieces of bread in addition to the one that came with the bus ticket for brunch. That’s the thing about me and traveling: I screw up my already screwed up eating schedule. It’s either I eat too early and too much, or put off eating until the restaurants close. I was feeling rather iffy that morning, and didn’t feel like eating so I just ate one of the breads just so I can take my medicine. Unfortunately, thanks to this terrible eating habit, I’m now suffering of clogged sinuses. I must clear this up by Monday! Streetside roti. Yummy treat for only THB 10! Back to the story. We boarded the bus around 10:15, but it wasn’t until 10:40 that we set off for Bangkok. The notes at the TOA guide says that these government buses make less stops than the privately owned buses. The bus stopped at least 5 times at different stations along the way, and I dread to think how many more stops the privately owned buses make. The trip was comfortable — the bus was only half full, there was enough legroom, the airconditioning is just right, and the roads were pretty smooth. There wasn’t much traffic along the way until we reach the outskirts of Bangkok. Still, the trip took only 4 hours, an hour less than the 5 hours I initially thought. From the station, I follow the signs to the metered taxi queue. True enough, the driver turned on the meter, and we set off for Banglamphu. While I was still halfheartedly planning this leg of the trip, I faltered between staying at Shambara again in Khao San Road, or staying at a different place in the Silom area. 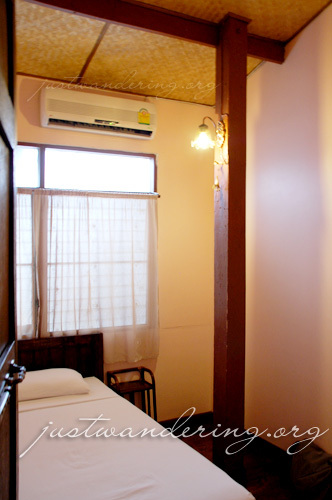 The merit of staying in Silom is that it’s somewhat near the BTS station, which makes it easier and cheaper to get around. However, the rooms there are expensive, so I opted to go back to Shambara where there’s wi-fi available inside the rooms. Unfortunately, when I checked in, they told me that the internet is busted. Pfft! I quickly set off writing the first part of this entry, since I knew I might come home late since I’m meeting Ming for dinner. However, ten minutes in and I got a call from him, advising me to leave the area before 5pm, since rush hour can be quite deadly. I quickly saved my work and had a shower to freshen up. 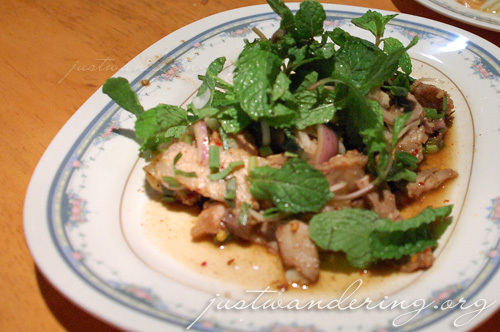 Shambara is located near the other end of Khao San Road (the Burger King side). I go out this street instead to hail a cab. I flag a hot pink cab, and as it approached me, I see the window going down. Bad sign. The driver asked me where I’m going, and when I said Silom, he said THB 200. I just came from Morchit, which is a lot farther than Silom and it only cost me THB 101. I said no and walked away. He drive after me and said THB 150. I tried haggling it down to THB 120, but he doesn’t want it. I walked away. He finally got the message and drove off. Right after he passed, I flag another taxi and the driver automatically turned on the meter. Traffic was still light when we left, but in other areas, it was starting to build up, specially in the CBD. We got to Silom about 30 minutes later, and the meter was at THB 107. I gave the driver the THB 120 I was offering the other driver. 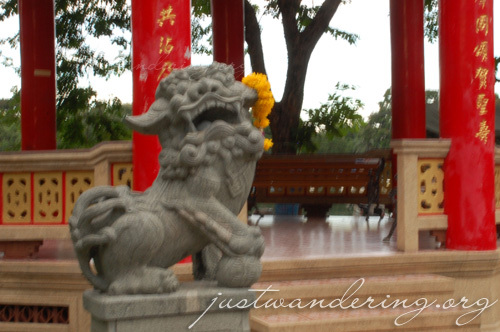 I met up with Ming outside his office building, and we made our way to Lumpini Park. 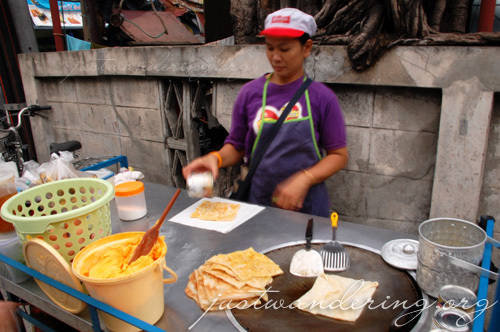 Similar to Makati, there are plenty of street-side vendors selling different kinds of food along Silom Road. These stalls have their own specialty, and Ming pointed out his personal favorites. Lumpini park was a great respite in the middle of the city. There were paved walkways and plenty of greens that gives you a breath of fresh air while still being in the middle of the busy business district. There were people jogging, doing aerobics, roller blading and skateboarding. It’s a lovely park, and I sort of regret not visiting it the last time I was here. We walked through the park and out the other gate. Just as Ming was thinking of where else we can go, he heard the opening strains of the preamble. He ushered me back inside the park and we watch as everybody stop whatever it is they’re doing and stood still as Thailand’s national anthem came out of the numerous speakers around the whole park. From the entrance across the Suam Lum night bazaar, we walked down the road, past the Lumpini police station and came upon this stall selling roti. Aside from Roti mataba, I haven’t tried roti in Bangkok before. It was like a crepe, only a little chewier, and it was slathered with margarine and some sugar. For THB 10, it was a great start to an awesome pig out session. We turned down the small street and walked all the way to Polo Club. It was another welcomed respite from the city, albiet only for the moneyed few. Interestingly, they have areas for different kinds of sports except for polo. But we were there for food. We both have lemon juice and shared a plate of Northeastern sausage. 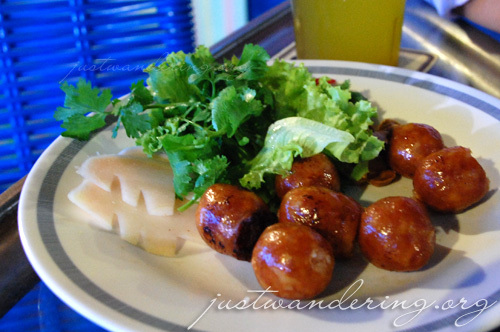 Similar to the Philippines, Thailand have different kinds of sausages, depending on their location. The northeastern sausage reminds me of the Ilocos Vigan longganisa, though it was eaten with cabbage, cilantro, onions, garlic roasted peanuts and chili. From the polo club, we walk back down the street to one of Ming’s favorite restaurants. Now called the Polo Fried Chicken (because it’s located in the street leading up to the polo club), this restaurant can be likened to Max’s Fried Chicken in the Philippines — homegrown specialty recipe for cooking fried chicken. I let Ming do the ordering, and we ended up with food enough for three people. Aside from the garlic fried chicken, we also had nam tok (pork neck salad with mild chili sauce and mint), papaya salad, northern sausage, and fried fermented pork rib cartiledge. I’ve never been a fan of the papaya salad, and the fermented pork is pretty weird, but the northern sausage was a hit, though it was a tad too spicy for me. 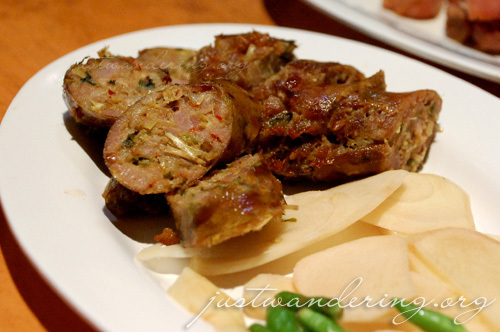 Unlike its northeastern counterpart, the sausage was bigger (the northeastern sausage is roughly the same size of the Cebu longganisa), and it has the herbs and spices within the sausage. 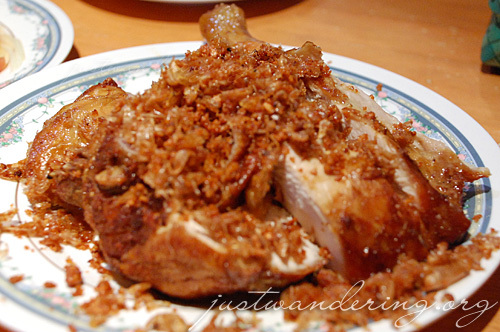 The nam tok is also an instant favorite, as is the chicken that has crispy skin (sans batter) and very very tender and juicy meat. We each had a serving of sticky rice to eat along with the flavorful dishes, as well as a bottle of iced tea each and a bottle of water. The total bill? THB 320. For a meal that can feed three persons, this is very very cheap and well worth the walk. After the great dinner, we headed over to this mall in Sukhumvit for some people watching. We ended up going to the supermarket instead to compare the goods in Manila. From there we walked over to this retro cafe that is tucked inside a sleepy street. It as like SaGuijo in Makati; you wouldn’t think there would be a cafe there. We only had after dinner drinks, but the place was so kitchy that it’s very great for just hanging out and having a chat with friends. I was starting to feel really uncomfortable with my clogged nose and I knew I should rest soon, so we called it a night and I got on a cab to KSR. Khao San Road was very much alive, and there are vendors and tourists milling around the streets. I join the fray, though not to party or ogle; I need to go online! I finally found one and sent off a quick e-mail to my family and answered some e-mails before grudgingly ending my session (I only had two 10-baht coins and each console is coin operated). Now, I’m settled back in Shambara, hoping that I’ll get enough sleep tonight. Ming has written down my itinerary for the weekend (since he’ll be out of town), and even taking time to have someone write the names in Thai. I don’t think I can do all of them though — I really need to cure this cold before flying on Monday or it’d be hell on my ears again. RELATED: What's really happening in Thailand? I totally get you re: ‘not being friendly’ and shouldering the costs of the taxi. I’d probably do the same as well, rather than risk sharing a cab with smelly travellers, and having to do small talk for many hours! Parang Manila din ang taxi drivers! Haha. I loved that bit about the national anthem, though. Hope your cold clears up soon! How are you communicating in Thailand — Tagalog, or English, or, do you speak some Thai? I found you can sort of get by with English in Bangkok, but outside of the big city it’s more of a challenge. Too bad you’re not staying longer in Thailand. A trip to Lop Buri, to explore ruins and get harassed by monkeys, would be fun! This is an AWESOME trip blog — probably your best work on the site since you started it! Davidd: In English, mostly. My friend gave me an itinerary with the names in Thai, so I just point the name so they can understand where I want to go. In Aranyaphratet, they know some English, since a lot of travelers pass through the town to cross the border to Cambodia.